Defending Pro12 champions Glasgow Warriors snuck home against bottom side Treviso on Friday, but head coach Gregor Townsend maintained he was "delighted" with the victory. 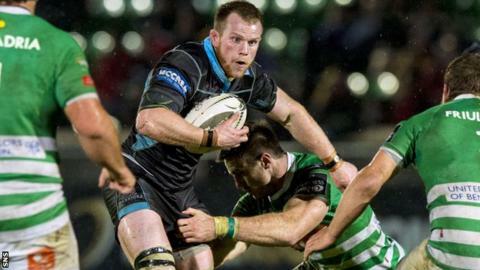 The Warriors had trailed at Scotstoun until Adam Ashe's 72nd minute try. "I'm delighted because we were trailing for a long time," said Townsend. "Fair play to Treviso, they came with a very specific game plan, looked after the ball very well in the first half, we didn't get to see it that often." Townsend added that inclement weather conditions hindered Glasgow's capacity to build phases and threaten the Italian line. "I think the weather conditions and the opposition were the factors in how we maybe didn't play as well as we'd set out to," he said. "It was a night for ball carries and defending, and players really stepped up there. It wasn't a night for those passes across the field and offloads, but I thought the pack played very well. "I thought the subs, both backs and forwards, made a big impact. It's quite tough when you come into a game when it's cold and wet but they did very well." The Warriors now enter a hectic festive period, travelling to tackle Leinster next weekend, before respective double-headers in the European Champions Cup and Pro12 with Scarlets and Edinburgh. There is also the small matter of Glasgow's rearranged visit to Racing 92 on the weekend of the 8-10 January, postponed two weeks ago due to the Paris attacks. "If we look at the next few games separately, in the league, we're playing teams around us, Leinster and Edinburgh home and away," began Townsend. "And then we've got the two games that we have to win probably to have a chance of qualifying from our (Champions Cup) group and that's Scarlets home and away."